Over 300 young farmers recently attended the Young Farmers’ Clubs of Ulster Association’s AGM and conference, sponsored by Massey Ferguson, one of the world’s leading tractor brands. The event was held at Armagh City Hotel. The YFCU put together an informative morning programme for members as well as delegates from sister organisations Macra na Feirme, the Scottish Association of Young Farmers’ Clubs and Welsh Young Farmers to take part in. Before embarking on the day’s proceedings, members had an energising workout provided by Armagh City Hotel staff. Outgoing president Roberta Simmons then welcomed members to the conference. Ulster Wildlife’s Grassroots Challenge delivered one of the two workshops at the morning session of the YFCU AGM and conference. The project officers Shona and Andrew gave an overview of the project and how to get involved with either a Club Night Challenge or a Wild Idea Project. They had some bird themed ice breakers and they brought along a long eared owl called Otis. The second workshop was provided by Alison Armstrong from Ascert who delivered an informative drug and alcohol awareness talk to the members. The association’s most eagerly awaited competition took place just prior to the AGM. Four clubs had made it through to the final of the Club of the Year competition sponsored by Power NI. 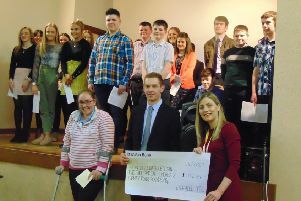 Dungiven YFC, Donaghadee YFC, Randalstown YFC and Holestone YFC took part in an interactive quiz to determine the winner. After a nervous wait, Dungiven YFC were announced as winners and received the Club of the Year trophy. The Club of the Year competition was established in 2012 in memory of former YFCU general secretary Arthur McAllister. During the AGM in the afternoon, the presidential team for 2017/18 was announced. James Speers, (Collone YFC) was elected into the position of president of the association and Zita Blair, (Moneymore YFC) was elected to the position of deputy president. The positions of vice president went to re-elected members Harry Crosby, (Spa YFC) and David Oliver, (Dungiven YFC) while Peter Alexander (Glarryford YFC) and William Beattie (Finvoy YFC) were elected for the first time as vice presidents. Brooks Allen (Collone YFC) stepped down as vice president after two years in the role and president James Speers thanked Brooks for all his hard work and wished him well in the future. The YFCU would like to thank Massey Ferguson for their sponsorship of the AGM and Conference, Armagh City Hotel staff for the energising workout and to Ulster Wildlife and Ascert who delivered the workshops to the members. l For more photographs from the YFCU AGM and conference click on www.farminglife.com.